Hi there. I'm sorry I've been kind of M.I.A a bit lately. If I could tell you about my week I would, but to be honest, it's too intense I'd rather just say... well... it sucked. But it's Saturday, and it's Mother's Day tomorrow, and I should probably say something about my mum. After my last post my mum rang me and said "can you stop talking about me on your blog!". I said sure, but I lied. I can't help it. Not only is she lovely, and caring and pretty much my rock, but she makes me laugh. Most of the time unintentionally. (Oh and Colin you're my rock too but there is only so much of my whinging and constant talking that you can put up with that I have to then dump on mum). So I dedicate this bread to mum. Why? Well first of all, when I first noticed everyone cooking bread in a Dutch oven, it was my mum who came to the rescue and gave me her Le Cruset pot! Those heavy, expensive pots - I now own one! Mind you when she gave it to me it was covered in dust, so I'm assuming it hasn't been used in years. Never the less, I have one of her pots that I will no have for the rest of my life. The other reason is she's been the one who has taught me everything about cooking (along side every cooking show on tv) so why not dedicate this recipe to her. Let me tell you about this bread. Oh. My. It's good. I have made bread before but this loaf is by far the best. It's almost like a ciabatta (my favourite). It's crusty and golden on the outside, and slightly dense, hole-y and soft on the inside. 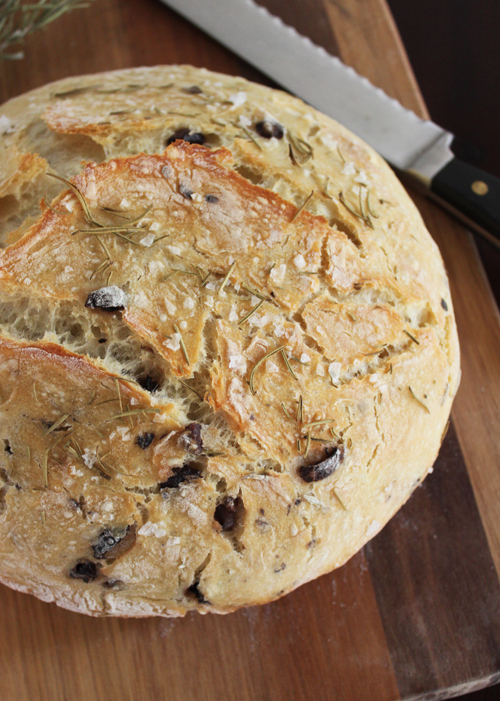 I knew a lot of people had been making this bread as it kept appearing on my blog roll. So when it came time to trying it, I googled until I found this recipe. It was by far the best photo, and really captured the style of bread I love. I altered it slightly, added some olives, rosemary and sea salt flakes, and viola, amazing. The best thing about this recipe is how easy it is. A trick to getting it to rise quickly - turn your oven on the lowest setting, turn the light on, leave for 10 minutes, then turn it off leaving the light on, put the dough in a bowl covered in plastic wrap, then let it sit in the oven for 3 hours. Done. Risen. If this doesn't work for you, cos well baking can be so unpredictable, leave it in there for longer, around 6 hours, with the light on. So go forth my pretties, and make bread! Sift the flour in a large bowl (either glass or metal, one that can sit in a warmish oven). Add the salt and yeast and mix well. Slowly add the warm water, mixing with a spoon as you go. When the dough is sticky but well mixed you might now need all the water), cover with plastic wrap and place in a warmed oven for 3 hours (you can leave for up to 6 hours or overnight). *** see note below for an update. When the dough have risen to double the size, remove from the oven. Turn the on the oven to 230°C and place the Dutch oven with lid on in the oven. If you have a pizza stone, place this in first then the Dutch oven on top - this will stop the base from getting too hot. 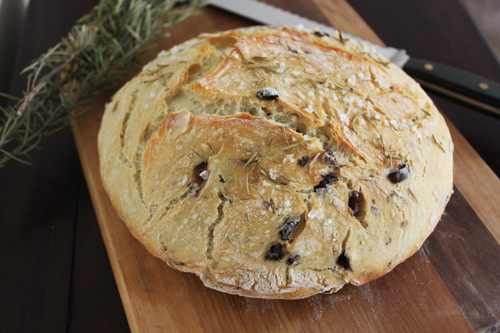 Add the olives and most of the rosemary to the dough and mix through with your hands. Dust a clean surface with flour, then place the dough on top and form it into a nice round loaf shape. Cover with plastic wrap and leave for 30 minutes while the oven heats up. After 30 minutes, carefully remove the pot from the oven, remove the lid, and place the dough in the centre. Sprinkle over the remaining rosemary and a good pinch or two of the sea salt flakes. Place the lid back on and return the pot to the oven. Bake for 30 minutes, then carefully remove the lid and allow to cook for a further 15 minutes. This will brown the top of the loaf. To test if its cooked through, either tap and listen for a hollow sound, or use a thermometer to check - it should be at around 85/90°C. ***Update - So I let it rise overnight in the fridge, covered in plastic wrap - works really well! So if you're in a rush, allow it to rise in a warm area (like an oven), but if you've got time, I highly recommend leaving it to rise for at least 12 hours (24 or more is even better!). It looks amazing! I used to make a similar bread back when I had a normal oven that heated up to 250 C. Now I'm stuck with one that barely makes it to 200! And oh, how I would love to have one of those Le Creuset pots! I too inherited a le creuset dutch oven from my mum, such a great piece to inherit as you know you'll keep it forever. When I pulled up this post my husband was practically drooling on the screen so I'll definitely have to make this beautiful looking loaf. If you make it again and you have the time to prove the dough overnight in the fridge, you should definitely do it, I find it gives the bread a great texture. So sorry you had a bad week - hope the one coming will be better. :) This bread looks amazing! 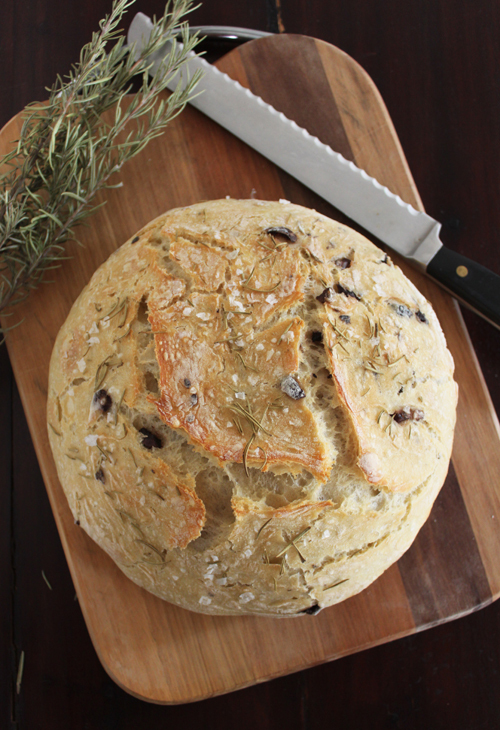 We buy a rosemary/olive loaf locally, but I love the idea of making my own. Thank you! Marushka82 - Oh no, that seems so low! Well I have the oldest oven so I'm surprised it reaches 200! Jules - I made it again over the weekend and let it rise overnight, but I found it ended up collapsing a little. I'll keep trying though to find the best method! 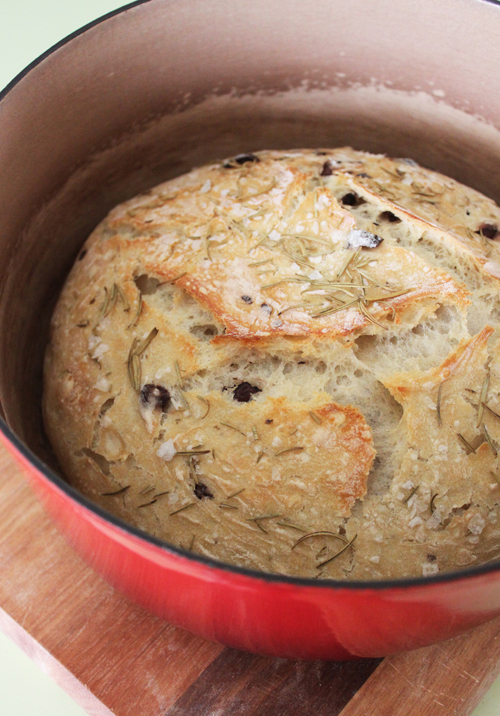 I had no idea you could bake bread in a Le Creuset casserole. Amazing, am seriously inspired to have a crack at it this weekend. Thank you! This looks delicious - as do many of your recipes and photos on here! Coming from an Italian family, I relate with many of your food stories on here, as well :) Great blog! I have been meaning to bake my first loaf of bread for a while now but I must admit, I'm a little intimidated. This recipe looks sooo good, though. I may just have to try it. Besides, I haven't used my Dutch oven in months and I don't want it to feel lonely anymore. What do you mean by plain flour? All purpose unbleached or bread flour, etc? What kind of yeast to use? Could I make this with spelt? Do you have any experience with that? Hi there, I've never used spelt flour so I'm not sure. I would assume that if spelt flour is used in regular bread making then there shouldn't be a problem. Your water amount might change though depending on whether the flour absorbs more or less water. Sorry I can't be of more help! Hello! Thanks for this mouthwatering loveliness! Looks fantastic. I'm going to have a go, but I'm coeliac, so it'll have to be gf flour, which is probably not going to look anything like your delicious version - I'll let you know how I get on. thanks again! Great recipe! Any advice on how to make it if you don't own a dutch oven? Hi Sabrina! I would still get the oven really hot, and cook it on a stone that has also heated up. If you don't have a stone, then use a baking tray and slide the bread on with baking paper. I use a Pyrex/Corningware covered casserole dish, with a circle of parchment paper on the bottom. I would love to see how this recipe could be developed into gluten free or using a gluten free flour! Would the texture change, would the yeast activate? A thousand questions. But defiantly letting the dough and yeast activate is such a crucial step, I agree! I would love to try this recipe in class and alternate it with something other than olives and see how it comes out! would love to see how this recipe could be developed into gluten free or using a gluten free flour! Would the texture change, would the yeast activate? A thousand questions. But defiantly letting the dough and yeast activate is such a crucial step, I agree! I would love to try this recipe in class and alternate it with something other than olives and see how it comes out! I tried putting the dough in the fridge for almost 24 hours. It never rose--did I do something wrong?! Oh Beth that's no good!! Was the yeast past its expiration date? Yeast is really sensitive, so it needs luke warm water to activate (too hot and it will die, too cold and it won't "wake up"). You can test the yeast by adding a little to warm water and seeing if it puffs up into a smooth thick liquid. If its off, it won't work. It's also helpful to feed it a pinch of sugar in the warm water! Although I have never used sugar, I always use fresh instant/quick rise yeast. I have never had the dough not rise in the fridge. Also, I use bread flour. Do you know if you could use cassava flour in this recipe? could I use spelt flour in this recipe? I 'm making the dough now. It is very fluid is that normal? I will put it in the fridge till tomorow. Is the dough always that fluid before rising? It looks of I use to much water. Yes it's a very sticky dough. Whenever I make this loaf I add the water a little at a time - sometimes it doesn't need the full amount. Baking is a little like that! I made this bread today! Turned out really tasty and very crusty :). I was a bit worried when it just came out of the oven. Because it was quite tough I was worried I baked a brick! But that wasn't the case at all, very nice and soft on the inside! Just very crusty, in a good way though! What size is your pot? I am looking at buying one and debating between sizes! I'm wondering how many servings this makes--I'm trying to enter calories into My Fitness Pal, and am hoping I don't blow a significant allowance on a slice of this great looking bread! Sorry I'd love to, but the blogger template doesn't make it easy to create one. Can I make this with just a cheaper dutch oven? Do you think it would come out just as good. Most likely! I think the key with the cast iron pot is to create a really hot casing for the bread to crisp up. I have made the bread on just a stone and it also works, but doesn't rise as much as in a cast iron pot. I was wondering when you say to let it rise 12-24 hrs.,would that be in the frig or in a warm place? I cannot wait to make this bread! !I was wondering, do you let it rise for 12-24 hrs. in the frig or in a warm place? I usually make bread in a 450 degree oven. 230 seems very low. My bread is not rising, I was wondering if I should turn up the degree? Hi, the 230C is Celsius, not Fahrenheit. You definitely want around 450F. Hi! I just tried this bread yesterday and it was a hit! This was so easy, even a non-baker like me was able to make it work and get raves! I misread the temperature and had it on 230F for the first half hour thinking, "that's awfully low" but then I'm not a baker as I said and was horribly jetlagged at the time. When I realized my mistake, I raised the temperature and baked as directed and it still worked. This is my new favorite bread. I gave the first try away to friends for a dinner party - making one today for me! Thank you! It's the best, hey?! I'm no bread baker but it always works for me. Can I use a cast iron pot to bake this bread in? Yes that will work perfectly! I was really excited to try this recipe, but unfortunately was quite disappointed by the result. The bread did not rise at all despite the 24 hours I gave it in the refrigerator. I suspect that 1/2 teaspoon of yeast is too little of an amount to let it rise properly. When I baked the bread and tried a piece, it was far too salty. I think that 2 teaspoons of salt is too much for the recipe, especially with the addition of kalamata olives. I'm sorry you didn't have a great experience with this recipe! I've made this bread 20 or so times and the dough can vary due to the temp outside and inside the fridge, humidity etc. I have also made this sitting it on a bench top for 18 hours and it works well too. Half a teaspoon is definitely enough. As for the salt, it works well for my tastebuds but can understand it may be salty for others. I do hope you give it another try! can i make this with bread flour? Most likely! Although the flour to water ratio might be a little different, so add a bit at a time until you get a nice consistency that isn't dry or too sticky. You can leave it in the fridge for a couple of days.. 24 hours is just a minimum to make sure it rises properly. Fantastic recipe! GREAT results with a GREAT taste! It was a hit all round!